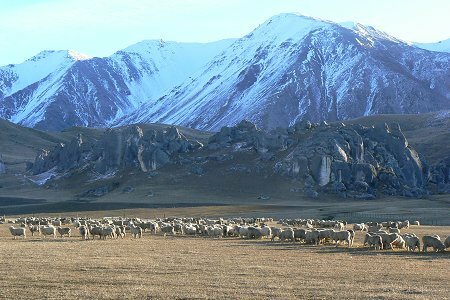 Kura Tawhiti Conservation Area is approximately 50 km from Arthur's Pass towards Christchurch (100km from Christchurch). Access to the reserve is about 1km on the Christchurch side of Castle Hill Homestead, the track follows a line of pine trees from the large car park. 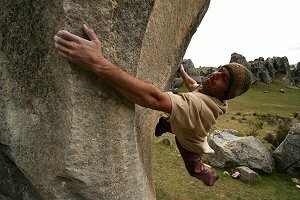 Kura Tawhiti (Castle Hill) is an extremely popular place for climbing and bouldering. There are a large number of bolted climbs within the reserve. Nga-i Tahu wish to encourage respect for their association with Kura Tawhiti. A rock-climbing code is in place, and rock climbers are asked to be aware that to Nga-i Tahu, climbing the outcrops denigrates their tapu status. Kura Tawhiti is an ideal place for exploring and picnicking. This area has special significance to Nga-i Tahu, with ties that stretch unbroken from distant ancestors to present generations. Kura Ta-whiti literally means "the treasure from a distant land", referring to the kumara that was once cultivated in this region. Kura Tawhiti was claimed by the Nga-i Tahu ancestor Tane Tiki, son of celebrated chief Tuahuriri. The nearby mountains were famed for kakapo, and Tane Tiki wanted their soft skins and glowing green feathers for clothing to be worn by his daughter Hine Mihi. Such stories link Nga-i Tahu to the landscape. The traditional knowledge of trails, rock shelters and rock drawings, and places for gathering kai (food) in the area known as Kura Tawhiti form an integral part of past and present tribal identity. Kura Tawhiti has To-puni status, which is a legal recognition of the site's importance to the Nga-i Tahu tribe. The term comes from the traditional custom of chiefs extending power and authority over areas or people by placing a cloak over them. The existing status of the land as a conservation area is unchanged, but To-puni status ensures that Ngai Tahu values are recognised, acknowledged and respected and Ngai Tahu take an active role in management. It recognises Nga-i Tahu mana whenua and rangatiratanga and symbolises the tribe's commitment to conservation. The geology of the rocks at Kura Ta-whiti is tertiary limestone, mudstone, sandstone and tuffs. Limestone is formed from layers of organic sediment, deposited in deep oceans far from land. The layers are compressed into soft, soluble rock. The area was once under a large, shallow inland sea that began to infill some 30 million years ago. Pressure over time caused extensive uplift and folding and faulting of the Torlesse and Craigieburn Ranges. Thrust up from their origin, the limestone rock was eroded by water into these distinctive sculptured landforms, called a karst landscape. Kura Ta-whiti is a refuge for hidden treasures - some of the rarest and most endangered plants in Canterbury. Once covered in to-tara and tall shrubs, the area was cleared 600 years ago by fire and has been grazed for almost 150 years. Tussock and pasture are now the norm, with one lone, surviving to-tara nearby. Two very rare plants that prefer to live in limestone landscapes have hung on at Kura Tawhiti. These are limestone wheatgrass (Australopyrum calcis subspecies obtatum) and a tiny 3 cm high sedge (Carex inopinata). A shrubland restoration project within the reserve hopes to recreate the habitat for these botanical treasures. Kura Ta-whiti is also the site of the first reserve in New Zealand established specifically to protect a plant. Dr Lance McCaskill led a remarkable conservation effort in the early 1950s to save the Castle Hill buttercup, increasing numbers from 32 plants in 1948 to more than 300 today. The reserve has important scientific value as the longest running plant-monitoring project in New Zealand, and has also protected the Castle Hill forget-me-not (Myosotis colensoi).